Beijing's most famous snack streets have more than food on offer. Some are adjacent to streets where famous old brands still do business during the day. Some have specialties. All have stories. Here are four of our favourites in the capital. 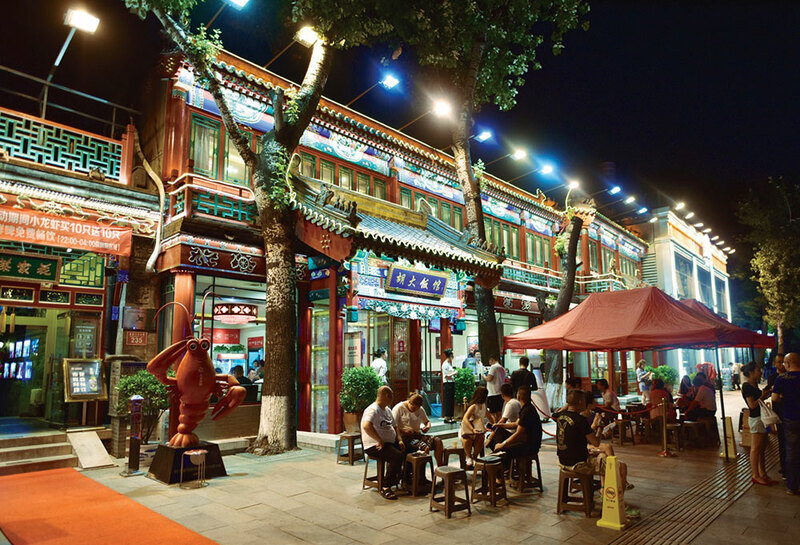 Once lined with palaces, Wangfujing Street is now lined with smart shops, but in the nearby hutongs you’ll find Wangfujing Snack Street. At first visitors may not realise it’s a food street because all of the vendors are clad in clean uniforms and signs that not only indicate what they are selling but the owner’s name as well. 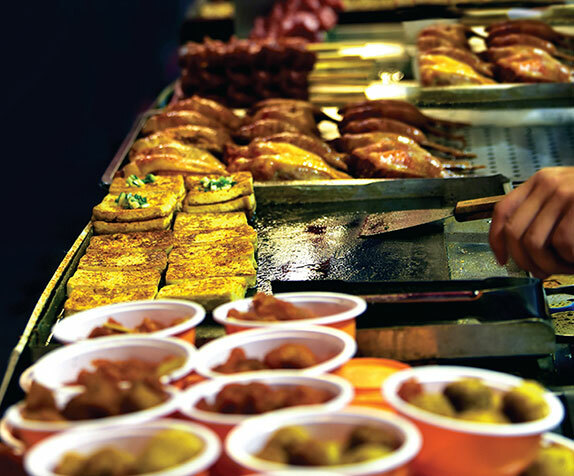 Wangfujing Street is where you can find snacks that are not all that common anymore. 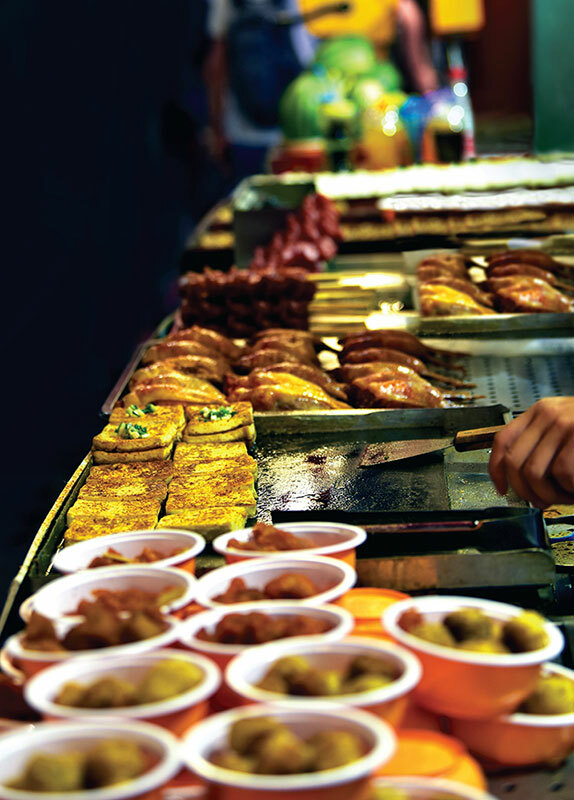 It’s most famous for chuanr, food on sticks, from lamb seasoned with cumin and chilli to chicken and octopus. There’s tanghulu, or candied fruit on sticks: kaorou sandwiches, with minced meat, tomatoes and cucumber, and skewered sweet corn for breakfast. Cow stomach, noodles with fermented soybeans and stinky tofu can be found. There are no places to sit, so eat standing at the stalls and stay within the lines that divide pedestrians from the traffic. Those in search of more unusual fare head for Wangfujing Street; the market has no tables, so stand at the stall to eat your food; roasted scorpions on sticks are not as popular with Beijingers as they are with tourists. 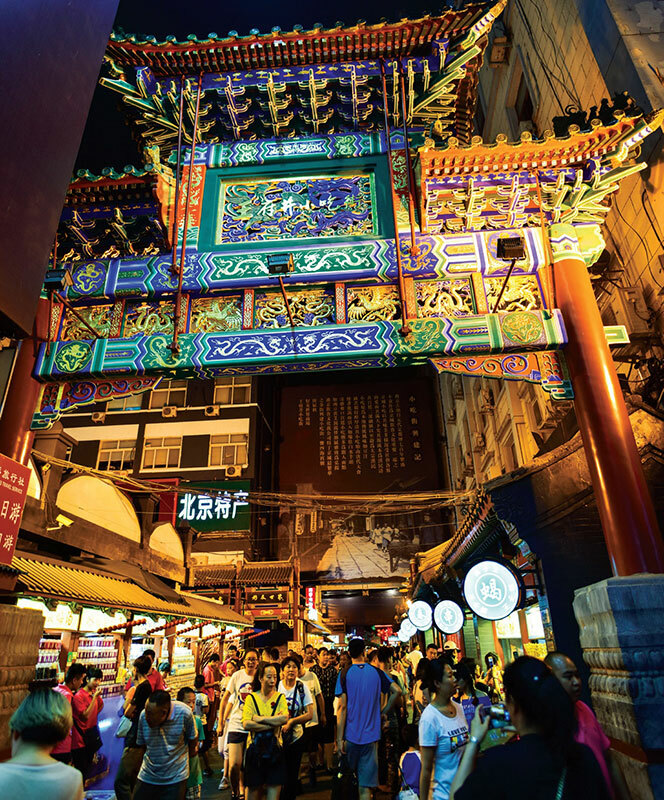 Like Wangfujing Street, Qianmen is home to renowned old brands, but the foodie action is in the narrow alleyways nearby where you will find hand-wrapped jiaozi and luzhu huoshao, pork intestines and bread in a thick broth. Off Qianmen are stands selling rou jia mo, a sandwich of slow cooked pork and cilantro in pocket bread, shots of baijiu and hot pot served from copper pots. Then on Lazhu Hutong, you'll find what one reviewer calls Beijing's best-kept secret: Muslim foodstalls selling dishes made with lamb and duck, marinated in cumin, chilli, turmeric, pepper and cardamom and served with onions and cilantro. 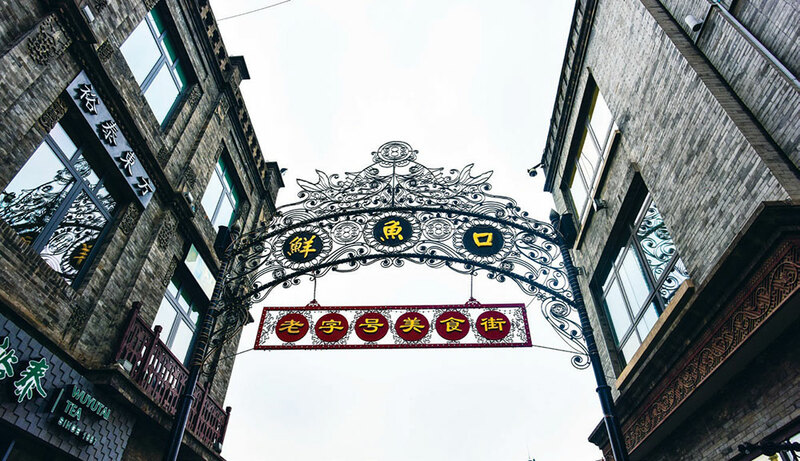 This 1,442-metre-long street probably got its name from lanterns used by workers at Beijing’s earliest fruit and vegetable market which gave it the name of ghost street. A change of character in the name worked because by all accounts this is the most prosperous snack street in Beijing, with 150 outlets, most of which never close. Guijie Street is also where to spot the latest food trends, including Sichuan and Sichuan-fusion snacks such as spice spirit crawfish, but there are lots of lao Beijing snacks like cooked tripe of lamb or cow, Beijing hot pot made with lamb spine and bull-frog dry pot, with a choice of three different cooking times and five different spice levels. The Qianlong Emperor’s mother fell in love with the city of Suzhou while accompanying her son on his excursions to the city. 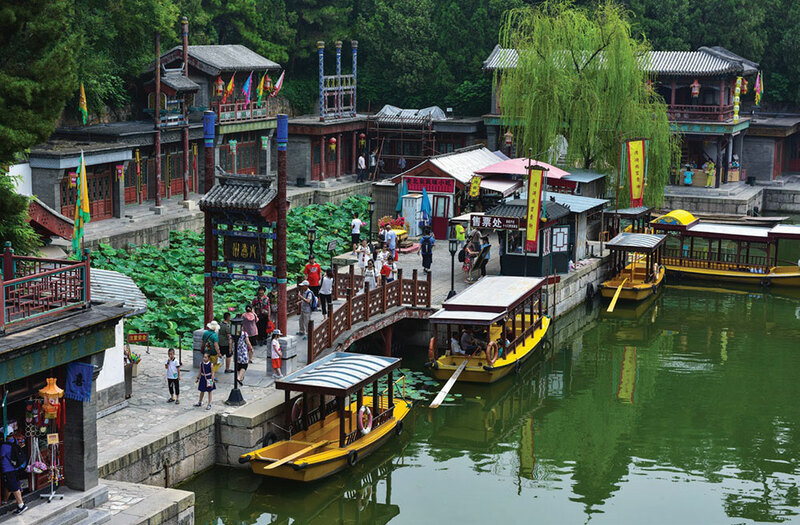 To please her on her 70th birthday, Qianlong Emperor recreated the water town on Back Lakes near the Summer Palace and his courtiers would play at being market people along “buy and sell” street. While the original Qing buildings on the Suzhou Market Street were destroyed, they were rebuilt in the 1980s. There are now Qing-style courtyard restaurants, many serving Imperial-style cuisine and smaller buildings lining the banks of the river selling a mix of traditional cuisines. Small boats can take passengers under the charming bridges that span the water. 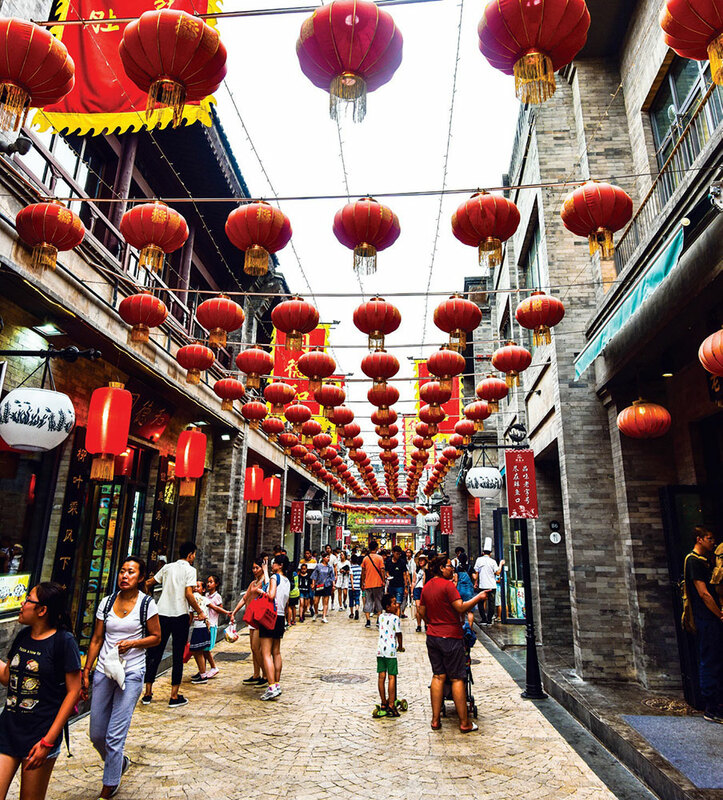 While Suzhou Market Street is a relatively new development, it is already being compared to Guijie Street; many Suzhou Market Street customers come from the nearby Information and Technology Zone and Back Lake itself can be easily reached from the centre of Beijing. This 1,442-metre-long street probably got its name from lanterns used by workers at Beijing's earliest fruit and vegetable market which gave it the name of ghost street. A change of character in the name worked because by all accounts this is the most prosperous snack street in Beijing, with 150 outlets, most of which never close.Guijie Street is also where to spot the latest food trends, including Sichuan and Sichuan-fusion snacks such as spice spirit crawfish, but there are lots of lao Beijing snacks like cooked tripe of lamb or cow,Beijing hot pot made with lamb spine and bull-frog dry pot, with a choice of three different cooking times and five different spice levels.